Turning. 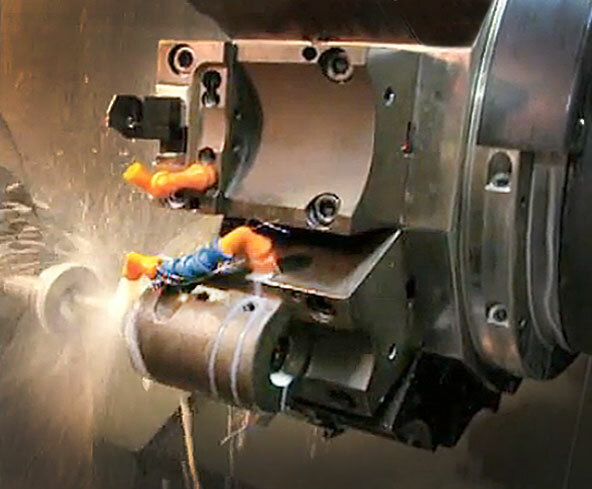 Our 7 CNC lathes are truly state of the art – with features that range from opposing spindles with bar feeding, the ability to turn with “live” milling and “Y”-axis milling capability, to simple chucker-type turning. Lapping. Our three-headed lapping machine with a 24-inch-diameter table enables us to lap parts up to approximately eight inches long. This machine allows us to hold flatness callouts as tight as .0001 on many parts. Watch the 1-minute video (to the right), in which one of our operators demonstrates the latest in lathe technology. View a list of our CNC Turning Equipment (PDF).